331st day of the year. There were then 34 days left in 2018. 67th day of Fall. There were 24 days left till Winter. Polls are open, Mississippi! Make sure you get to the polls before 7pm to cast your ballot. 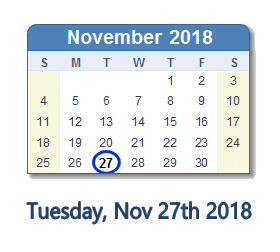 What happened on November 27th 2018?